Cleats you can make for your boat from wood off cuts. Make Your Own Wooden Cleats. Not only are Wooden cleats easy to make they are in many respects superior to the metal variety. Because the wood is softer than metal it is much kinder to the rope. 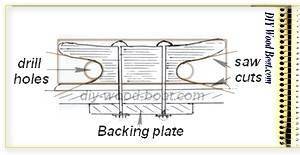 And because wood will also create more friction than metal type, it will hold your boat's mooring lines more securely. How to Make your own Mooring Cleats. The first is made from a solid block of suitably sized wood. The main criteria are that the grain should run along the horns and the space under the horns should allow enough room, so that even the largest rope you are likely to use won't jam. When marking out the shape on your block use a half pattern which, can be flipped over to provide a symmetrical outline. 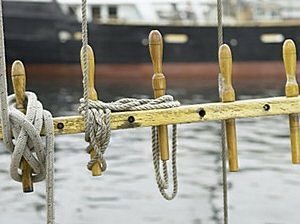 For mooring, drill holes for the base using a drill bit larger than the diameter of the thickest rope likely to be used on it. Then cut out the waste wood with a saw to give the basic rough shape. The next stage is to round off all the corners and give it a bit more shape. I have found a Japanese Saw Rasp a quick easy way to rough shape convex surfaces. You'll need a round rasp for the concave edges. As the base is where greatest friction occurs, this will need to be well rounded at both ends. Finally, a really good sanding to make it as smooth as possible. I mount mine on a hardwood base in order to keep the rope clear of the nonslip deck surface. You can if you wish drill a hole or slot through the base. This needs to be between the two through bolts and below the level of the horns. This second method is how I made the center-cleats for Mignonne. I used the same 1inch/25mm square lumber I used for the handrails and toe rail. This was simply a cross bar resting on two short pillars of the same stock and resting on a hardwood base. The wood was cut to length, holes drilled for the through bolts then glued and bolted together. To finish all the corners were well rounded and sanded smooth. There is a formula which states that the length of the horns should be 6 x the circumference of the mooring line. However, for any boat over 20 foot I wood suggest that they should be at least 9 to 10inch, 230 to 260mm. For any boat less than 20 foot, the horns want to be at least 6inch across. It is possible to make them from almost any wood even fir, though a hardwood is best. The best choice is probable well seasoned locust, or white oak. "There is something elemental about boats that favour simplicity in place of fussiness. Many of the legendary boat designers were known for advocating simplicity and its working partner, economy. Mooring cleats normally will mainly be subjected to loading from the side. However, in some situations, such as tied to a fixed dock with a falling tide, they may have to bear considerable upward pressure. They will also be subject to twisting as the pressure is exerted on the line leading from one side. So, those for mooring must have strong horns with the wood grain running along the length. They also need a minimum of two through bolts from the top of the horns to a backing plate below the deck or through a deck-beam. If you use carriage bolts as the fastenings there is no need to countersink as the domed heads won't interfere with the cleat-hitch. Backing plates need to be much larger than the base area of the cleat. If using either plywood or solid wood the through bolts must be fitted with large diameter washers under the nuts or a metal plate. Cleats, apart from those used for mooring, should be installed at an angle of about 10 degrees to the lead of the line belayed to it. This will help prevent the standing part of the line becoming jammed between and the horn and the figure of eight and help reduce chafe. Mooring lines should be lead through a metal fairlead before cleating off. There is very little point either varnishing or painting a mooring cleat as the rope friction will soon wear through even the toughest finish. A good soaking hot linseed oil or any other wood oil (I prefer Tung oil) will help to prevent any checking. Once the oiled wood is dry it can be buffed up to give a very pleasant sheen. Wooden jammers are equally easy to make. As the line only needs to go around once there only need for a long horn at the front. With this cleat, we do want the line to jam so the horn slopes down to the base plate at an acute angle without any clearance. Other belaying options include using the king post or bollards. And don't forget the age old Fife rail with Belaying pins. This is a very efficient method for quickly and tidily securing running rigging. And the lines can be released quickly just by pulling out the pin. On an open and framed boat you can fit a bar across pairs of frames to act as a belaying point. Or do as I have done on Mignonne and fasten a bar across the taffrail supports. On mine I have incorporated two notches on the top as jammers. So make use of all those off cuts you have lying about. Make yourself some good sized cleats which will not only enhance the look of your boat but will, probably be more efficient than those you can buy.